An after-action report on the toppling of Silent Sam reveals “serious deficiencies” in how UNC-Chapel Hill law enforcement handled the situation. The UNC Board of Governors voted to make the report public Jan 15 and disclosed it the afternoon of Friday, Feb. 1. 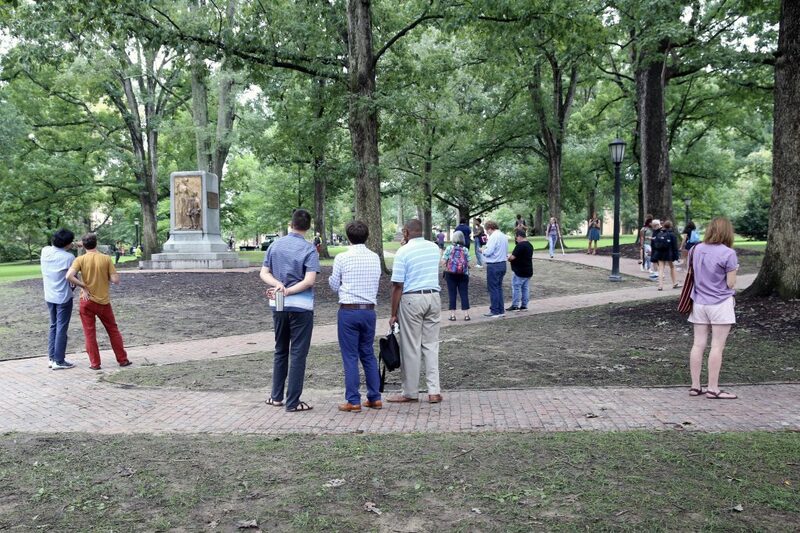 The UNC-Chapel Hill police department and the university administration have been criticized about how they handled the situation Aug. 20, when protesters pulled Silent Sam from its pedestal despite a police presence. Lawyers from Parker Poe Adams & Bernstein LLP and law enforcement management consultants from Hillard Heintze LLC wrote the after-action assessment and report. They interviewed dozens of members from the UNC-Chapel Hill police department, UNC-Chapel Hill administrators, UNC-Chapel Hill Board of Trustees, and witnesses. “We found that while there were serious deficiencies in the way the Aug. 20, 2018, event was handled, there is no evidence of a conspiracy between UNC-CH and any protesters or any other individuals to remove Silent Sam,” the report reads. The report says UNC-Chapel Hill must change how it plans for and responds to protests, because the university faces a growing threat from outside protest organizations and well-organized, nonstudent groups. A number of factors led to the forceful removal of Silent Sam. “Miscommunication between the University Police and UNC-CH senior leadership combined with inefficient and inadequate information-gathering, insufficient staffing, and outdated crowd control training made preventing what happened on Aug. 20 difficult if not impossible to achieve,” the report states. Silent Sam was erected on campus in 1913, after the United Daughters of the Confederacy requested a monument be built to commemorate the more than 300 students who died serving the Confederacy in the Civil War. The statue has since been the centerpiece of protests, demonstrations, and marches. April 30, Maya Little, a UNC-Chapel Hill graduate student, defaced Silent Sam with red paint allegedly mixed with her own blood. Little was arrested, which led to the planned protest Aug. 20. In hindsight, the report says, these predictions fell short of reality. Anticipating a low turnout, and considering the one-sided nature of the protest, just a handful of officers were initially asked to work. Barricades weren’t set up, either due to miscommunication between the police department and university administration or a belief the presence of barricades during the first weekend of the academic year would reflect poorly on the university. Several officers, per the report, said they were confused and uncomfortable after hearing barricades wouldn’t be used. During the Aug. 20 march and protests, officers tried to arrest people in the crowd who were wearing masks, but were met with resistance. Some officers were assaulted, and a protester threw a smoke bomb. As this happened, other protesters were able to surround the statue and set up banners. For a time they remained there to chant and throw red paint on the pedestal, but left about 9 p.m. to march up Franklin Street. Between 15 to 28 officers surrounded Silent Sam after a most of the protesters left on a march. About 9:14 p.m., a majority of the protesters returned to the statue. The report describes them as hostile and physical. The report says at least two officers were hit with the frozen bottles. Capt. Tom Twiddy, UNC-Chapel Hill Police Department patrol services commander, ordered the officers, none of whom were outfitted with riot gear, to pull back to the edge of the crowd. Soon after, the protesters tied a rope around the statue and pulled it down. Officers returned to surround the fallen statue and, once it began to rain, the protesters dispersed. Key decision-makers, such as the chief of the University Police Department and the chancellor, must meet and confer to discuss major campus events, says the report. The burden of gathering and analyzing upcoming events should be shared among several officers, it says, and University Police should provide ongoing, department-wide crowd control training to better prepare for large protests and hostile crowds.